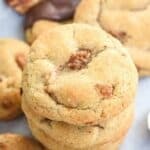 Chewy, soft snickerdoodles are kicked up a notch with maple flavor, candied bacon, and a drizzle of dark chocolate! Preheat oven to 350°F and prepare a baking sheet with a layer of aluminum foil. Lay each strip of bacon on the foil. Brush with a thin layer of maple syrup, then top with a layer of brown sugar. Place a wire rack on top of the prepared baking sheet, and then place prepared bacon on top. Bake for 20 minutes or until crispy – you want it to easily crumble once it’s cooled. Let cool completely on wire rack. When completely cooled, crumble into a small bowl and set aside. In a small bowl, whisk together maple sugar, granulated sugar and cinnamon. Set aside. In a large bowl, whisk together flour, baking soda, ground cinnamon and cream of tartar. Set aside. In a stand mixer fitted with the paddle attachment, cream together butter, granulated sugar and brown sugar until fluffy. Add egg, maple syrup and vanilla extract and beat to completely combined. Slowly add dry ingredients to wet ingredients and mix on medium speed until completely combined. Add crumbled bacon and stir to combine. If including chocolate chips, stir them in now as well. Place dough in the fridge to chill for at least 1 hour. Preheat oven to 375°F and prepare a baking sheet parchment paper or silicon mats. Measure out each ball of dough using a medium cookie scoop, and roll each in the cinnamon sugar mixture. Place at least a couple inches apart on prepared baking sheet and bake for 8-10 minutes, or until the tops have cracked. Let cool on baking mats, as they will spread just slightly more as they set. Move to wire racks to cool completely. Drizzle with melted chocolate and let set completely. Package them up, craft a handwritten note and gift them to someone you love for them to enjoy!